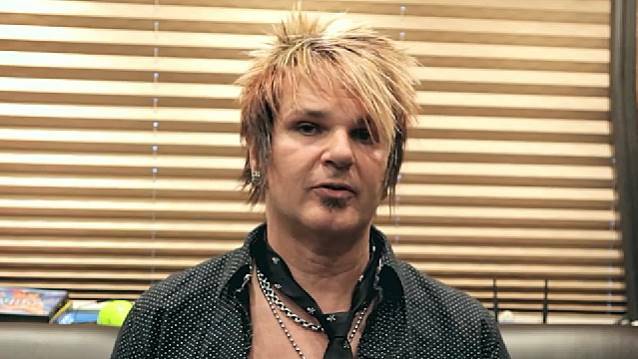 POISON drummer Rikki Rockett says that it is unlikely the band will hit the road this summer because a certain member of the glam-metal act is "making it a problem." The Bret Michaels-fronted group last toured the U.S. in 2012 as part of the "Rock Of Ages" package with DEF LEPPARD and LITA FORD. During a January 25 interview with BackstageAxxess, POISON bassist Bobby Dall stated about the prospect of the group hitting the road this year: "We'll probably, more than likely, be going out this summer and playing 40 to 60 shows around the amphitheaters and different venues across the country." However, in a February 27 tweet, Rockett dashed fans' hopes that POISON will actually manage to play any dates in the foreseeable future, writing: "Doesn't look good for Poison touring this summer.(Again!) Guess what member is making it a problem?" In a 2012 interview with DelmarvaNow.com, POISON frontman Bret Michaels was asked if the fact that classic hard-rock bands like VAN HALEN and KISS seem to be spending more time in the studio working on new material than in recent years means that fans can also expect a new POISON studio album in the not-too-distant future. "Never say never," Bret replied. "We have no concrete plans for a new album at the moment, but the POISON guys are like family to me." He added, "I've been out all summer with them on the  'Rock Of Ages' tour [with DEF LEPPARD] and you never know what can happen." The last POISON album was 2007's covers set "Poison'd! ", while the band's last collection of new, original music was 2002's "Hollyweird". To celebrate POISON's 25th anniversary, 35 of the multi-platinum band's top hits and fan favorites were gathered for "Double Dose Of Poison: Ultimate Hits", a career-spanning 2CD and digital collection which was released in May 2011 by Capitol/EMI.